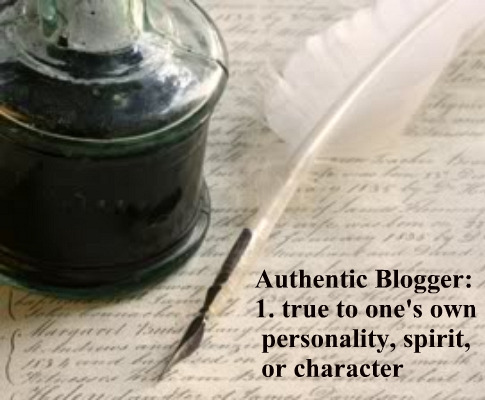 Authentic Blogger: Spotlight On....new monthly series! When I first began blogging back in 2009, I was literally overwhelmed with all that I had to learn about the blogging process. I dove in and did quite a bit of floundering, but along the way, I connected with a core group of bloggers who have since become dear friends. (The Blogging Class of 2009, Healing Morning, 12/13/2010). There are many firsts that you experience with your blog. One of them is blogging awards. These are fun, informal awards that different bloggers create, along with an award icon and a set of criteria for each award recipient to follow. I clearly remember the first time I was given one of these awards - I was very happy to learn that other bloggers were reading my work and enjoying it enough to offer a symbol of recognition. The downside of these blog awards is that they become viral in a very short period of time, with many people sending you the same award and overloading your page. I have given this concept a lot of thought over the past two years, and I believe I've come up with my own version that works for me. Blogging itself is cyclical. You'll find yourself interacting and connecting with your own core group of blogging friends. These are the people who you'll turn to for advice on programming the newest gadgets/widgets and applications on your blog. They're also the ones that you'll trust to give you honest, sincere critiques when you make changes to your formatting. So, obviously, it is very important to build that core group for yourself. It is equally important to continue to broaden your horizons in the blogging world. Keeping your content fresh and new becomes a bit more challenging the longer that you write. So, you'll want to explore new ways of attracting readership. With that in mind, what I decided to do is take that blogging award concept and spiff it up a bit. 1. Be a member of Authentic Blogger Facebook Group & have the Authentic Blogger button posted on your blog page. You will find our button & the code on the home page, on our right hand sidebar, just below the FB and Twitter share buttons. 2. If you are interested in your blog being posted in an upcoming Spotlight On blog post, shoot me an email with your blog link, make sure you have the Authentic Blogger button posted on your blog page, and I'll add you to my list of prospective blogs. 3. Be an actively involved member of the blogging community. By this, I mean that I will have noticed you writing thoughtful comments on various blogs in the AB community. I really do pay attention to what's going on out there among our group! 4. 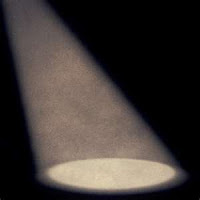 Upon learning that your blog has been chosen for Spotlight On, take a moment to post the link for this blog on your FB wall, and/or your blog page, if you like. Linking back to Healing Morning will ensure that everyone involved receives that much more traffic to their respective blogs. 5. Visit Healing Morning, follow my blog & leave comments occasionally. This is how I find a lot of really wonderful blogs to follow in return, so it's not as self-serving as it sounds at first glance. If you follow me and comment on my work, that keeps you current in my mind, and I'm more likely to visit your blog in return. That's it! Short and sweet criteria that's easily met. I hope that everyone that I spotlight in this column will enjoy the attention and gain followers for their blog. I was encouraged and helped by many wonderful bloggers when I first ventured into the world of blogging. This is my way of saying Thank You to everyone who spends time at Healing Morning and at Authentic Blogger. I will post this monthly column at both Healing Morning blog and at the Authentic Blogger sister blog, as well as several other blogging forums. The spotlighted blogs will benefit from this publicity and reach a much wider audience as a result. Derek's Home and Business Blog, author Derek Jones. Derek and I connected perhaps a month ago, and I have been extremely impressed with his informative content. If you're looking for a blog that gives you the newest updates on blogging tips, SEO and SEM as well as IT information, look no further. Derek is one that you'll want to follow. I subscribe to his email feedburner option so that I receive every new blog that he posts directly to my Inbox. Living with Food Allergies and Celiac Disease, author Mary Hudak Collins. Mary is a Mom with two children, one of which suffers from food allergies and Celiac disease. I find her content to be very well written and calm in approach. She offers realistic, logical solutions and tips in her blog posts. She's also very good about reciprocating with fellow bloggers, and I enjoy her thoughtful comments that she offers on my own work. Anna of Alaska, author Anna L. Walls. Anna was one of the first group of members to join Authentic Blogger back in 2010, and she's been a strong member ever since. Anna is a published author as well as writing two successful blogs. She has a quirky, delightful sense of humor and offers a fascinating window into what life is like living in Alaska. The Widow Lady, author Lisa Brandel. Lisa was also one of our earliest members at Authentic Blogger. Her blog is a valuable resource and forum for people who are dealing with loss of a loved one, or who are dealing with being a caretaker of a loved one. It might sound as though visiting her blog would be a sad experience, but the exact opposite is true. Lisa writes about all manner of topics that are grief related, and they range from funny, to dramatic, to educational, to downright absurd, and they address those topics that many shy away from. Lisa also invites many of her followers to do guest posts on The Widow Lady. Fireside Moments, author Anahid Boghosian. Anahid is one of our wonderful admins over at Authentic Blogger & was also a very early member of our group. Her blog covers a wide range of topics, from ruminations on current events, to helpful posts that cover a lot of blogging IT tips, to very funny content. Anahid is one of my favorite people in the blogging world & I always enjoy reading her perspective. I hope you'll all take time to visit these five blogs, read their content, and if you enjoy what you find, follow them. These five blog author fit what I consider to be the epitome of Authentic Bloggers and I am proud to call each of them blogging friends. I am really inspired with you blogging story. I just started in June,2010 but still am not a good blogger. I need to learn many things to be a perfect blogger like you. Enjoyed reading your story about blogging and your insight into different blogging aspects. You certainly have much knowledge we can tap into. Personally I'm not very keen on blogging awards as I also believe it's viral and an endless circle amongst blogging friends.